All oak trees imported from other UK nations into the UK will require a "plant passport" from the end of March 2008, the Forestry Commission says. It is part of an emergency measure to eradicate the oak processionary moth (Thaumetopoea processionea from British woodlands. for the benefit of the Plantation owner only. 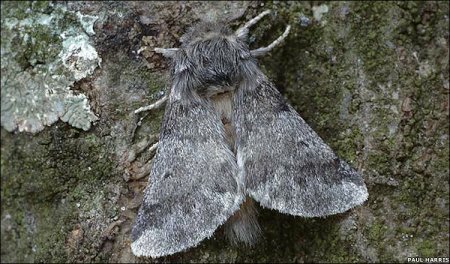 In 2006, larvae of the oak processionary moth, (Thaumetopoea processionea (Notodontoidea: Thaumetopoeidae) were found at several locations in London. This species is a major defoliator of oak in Europe. 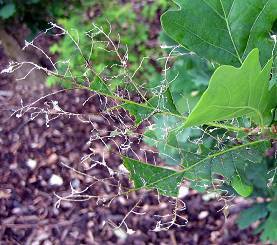 The larvae (caterpillars) feed on the foliage of many species of oaks, including English, Sessile and Turkey oaks (Quercus robur, Q.petraea and Q.cerris). Hornbeam, hazel, beech, sweet chestnut and birch are also reported to be attacked, although mainly when growing next to severely defoliated oaks. Oak processionary moth is a native species of central and southern Europe, where it is widely distributed, but its range has been expanding northwards, presumably in response to climate change. It is now firmly established in northern France and the Netherlands, and has been reported from southern Sweden. Larvae of the oak processionary moth are also a risk to human health. The larvae are clothed in numerous long white silky hairs, but much less evident is the covering of many thousands of much smaller irritant hairs (setae) that contain a toxin. Contact with these small hairs, or their inhalation can result in severe skin irritation and allergic reactions. These problems are similar to those caused by brown tail moth (Euproctis chrysorrhea), whose larvae also posess irritating hairs. 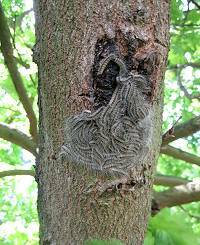 However, oak processionary moth is a more significant problem because once established it tends to be more abundant on urban trees, along forest edges and in amenity woodlands, where there is a high probability of it coming into contact with people. A tree pest advisory note has been published. It gives further information on the pest and photographs of the main life-cycle stages. It is native to central and southern Europe. Does it do any harm to humans, and what should be done about this? 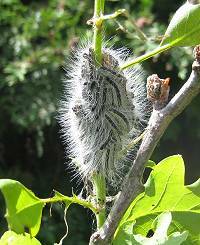 The hairs of the caterpillars have barbs and contain a toxin that can cause irritation to the skin, eyes and bronchial tracts of humans. We strongly advise people not to touch the caterpillars - or their nests, which can contain thousands of the toxic hairs. People should also keep away from infested trees, because the hairs can be blown by the wind and enter the eyes and throat and come into skin contact that way. Medical advice is a matter for the Department of Health and the health authorities, which are providing advice on symptoms and treatment to General Practitioners and other health workers. Anyone with a severe reaction, or who is uncertain what has caused their rash, should consult their GP. The hairs can also affect animals, including dogs, cats and horses. Is it true that it can cause death in humans? We are not aware of any deaths directly attributable to this species. We don't know for certain, but it was either by the immigration of an adult female that subsequently laid eggs, or, much more likely, by the importation and planting in Britain of living trees infested with over-wintering eggs on them. Is climate change a factor in its arrival? It is likely that the recent trends to milder winters, and in particular the reduced incidence of late spring frosts, which could kill significant numbers of young larvae (caterpillars), has been instrumental in the moth's ability to survive and breed. It might also have benefited from the exceptionally warm period last summer. How far could it spread in Britain? It seems likely that it could survive in much of England and Wales. Adult moths have been found as far north as southern Sweden, which lies at a similar latitude to Scotland, although there is no evidence that the moth has successfully bred there. 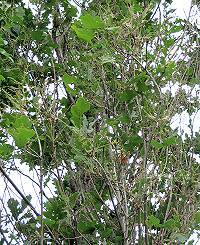 Like all defoliators, it feeds on the leaves of its host plant, but it is generally not fatal to them. Trees will produce leaves the following spring and recover, although there is some evidence that repeated attacks can harm the trees. Defoliation can be dramatic. Indications from attacks in Kew Gardens are that it will attack many species of oak, both those grown for timber and those for amenity purposes. Is it fatal to oak trees? There are no known records of it killing trees, although there is evidence that repeated attacks can reduce a tree's vigour. Does it or could it affect any other species of tree? How? Is it fatal to them? It has been recorded on the Continent on hornbeam, hazel, beech, sweet chestnut and birch, although mainly where they have been growing next to severely attacked oaks. It is possible that it might attack a new species, and this is one of the reasons why it is important to monitor the situation and to collaborate with researchers in other countries where it occurs. What's its behaviour (e.g. population cycles etc)? There is a single generation per year. On the Continent, larvae (caterpillars) occur during May and June. They live gregariously in webs or nests spun among shoots or on the trunks and branches of the host plant, and have the habit of following one another in long processions, hence the name. Larvae pupate in the webs at the end of June or beginning of July, and emerge as adult moths 1-2 weeks later. The adults fly during July and August, during which time the females lay their eggs on host plants. The eggs over-winter and hatch the following May. What can we do about eradicating or controlling it? Provided they can be found, it is possible to destroy egg masses before the eggs hatch the following spring. A more reliable method is to spray the larval (caterpillar) stages with an insecticide soon after the eggs hatch in the spring, and this is where our efforts will be concentrated in 2008. The nests can also be destroyed during the brief pupal stage in the summer, reducing the number of adult moths that will emerge from the pupae. What sort of operators do the work? Usually pest management experts who are fully compliant with the relevant regulations, and trained and equipped to do the work safely and effectively and in a way that safeguards human health, the trees and the local environment. Can ordinary householders treat the nests in their gardens? We strongly advise against this, because of the health dangers posed by the toxic caterpillar hairs in the nests, and because to be as effective as possible the job must be done at just the right stage in the moth's lifecycle by someone trained to do it correctly. Does Oak Processionary Moth have any natural predators that might keep its numbers under control? Do these predators exist in Britain? If not, is there any prospect of their being introduced if the moth does become established here? Oak processionary moth does have natural enemies in its native range. These include "generalist" predators such as some species of birds, beetles and small mammals, and parasites. We can expect some of our "generalist" predators and parasitoids to exploit populations of the moth here, but these might not have an overall effect on the moth's population dynamics. We will scope the potential use of natural enemies as part of a longer-term management strategy if it does not prove possible to eradicate it by direct action. However, any such proposal needs careful study and handling to ensure that introducing such an organism to Great Britain would not have adverse impacts here. You must not attempt to handle the larvae (caterpillars) yourself, or disturb their nests. Are we going to call the Army in, as Belgium did? How big would this have to get before we did call in the Army? We are confident that we can tackle the current situation with existing resources, and we have not discussed the possibility of calling in extra resources such as the armed forces. It would have to be a huge and very widespread problem before we took such a measure. What measures were in place to stop it coming in? The general controls that are in place governing the importation of all plants for planting should reduce the possibility of accidental importation of all pests. There are no specific import controls against Oak Processionary Moth. Why did our import control measures not keep it out? The international trade in live plants is enormous, and this, coupled with milder winters enabling the moth to survive as far north as Britain, means there was always a chance that some might get here through this route. Since the eggs are difficult to spot, it is not surprising that some could arrive without been seen; unfortunately, once they hatch they have a ready food source for the young larvae on the very trees on which they were imported. Although much less likely, it is also possible that a viable female moth could enter the country in a plane, train, ship or road vehicle, or be blown across the Channel, and lay her eggs on a tree in Britain. Our import controls are kept under constant review to ensure they are as effective as possible. Are our import control measures and their enforcement up to the job? Under various international agreements, and the EU Plant Health Directive, import controls generally only specifically target known pests that pose a significant threat to the health of plants and trees. There are requirements in place designed to ensure that all planting stock, from any source, is inspected before being consigned. One of the actions of the newly formed Outbreak Management Team is to carry out a formal Pest Risk Analysis, using internationally agreed standards, to determine the risks to our trees and what measures should be carried out to reduce the likelihood of further arrivals of the moth. What criteria are used to formulate import controls? Import controls are generally formulated following a system of Pest Risk Analysis which looks at the pest, its host, country of origin and potential for causing significant damage if introduced. If it meets the criteria it is listed as a 'quarantine' pest, and import controls are formulated accordingly. Forest Research is currently (June 2007) preparing a Pest Risk Analysis for oak processionary moth, and a decision on whether to list it will be taken when that has been completed. This will ultimately require consideration at EU level. What measures are available to the UK authorities to stop further accidental introductions? A pest may be declared a quarantine pest, that is to say a pest with potential economic importance to an area and which is either absent or is locally present and being officially controlled. With this status in place, the GB authorities can then impose restrictions on imports of host material, for example by insisting they be inspected pre-export and certified free of the pest before being shipped. We can also insist they come from places overseas that have been declared free of the pest. We may insist that certain measures be taken with imported materials; we may ban imports of plants from certain high-risk parts of the world, and we can impose restrictions on movements of plants within Great Britain. These sanctions will, however, require consideration at EU level. Why wasn't official action taken when the pest was first found? The pest was first found last summer (2006) and immediate action was taken to survey the area and to treat the infestations. We knew that follow-up spraying would be required this spring (2007), and this has been carried out. We now know that the moth is present at a greater number of locations than first found, and that is why we are gearing up for more concerted action. Compiled, formatted, hyperlinked, encoded, and copyright © 2007, John Palmer, All Rights Reserved.